While girlfriend Khloe Kardashian was at his home in Cleveland posting how "bored" she was on Snapchat and how ready she is to give birth, Tristan was hoodie finessing some mystery chick in the club in New York. Thanks to video footage from Daily Mail, which they grabbed from a partygoers' Snapchat, we see Tristan and a chick talking, then getting thisclose during a day party at PhD Saturday. Apparently, Tristan thought he could get away with some ish like this in the middle of a packed a** club. Usually, folks are reaching when they claim two people who are cozied up are f making out in a club. But this time, even without a clear shot, it's pretty obvious it was a kiss, if not a near-kiss. The girl's eyes are closed, her arm is around his neck, and her head is turned like one does when they lean in for a kiss. And if you think she's just trying to get closer so he can hear her better, her mouth is nowhere near his ear. Click HERE if you can't view video. At best, even if there was no kiss, Tristan is still all the way wrong for this inappropriate interaction. We noticed something was up a few months ago when Khloe - who's due to give birth any day now - and Tristan stopped going out together. The only pics that they've taken together since confirming her pregnancy have been the posed-at-home pics from the family's Valentine's Day party, baby shower, his birthday and the couple's maternity pics. 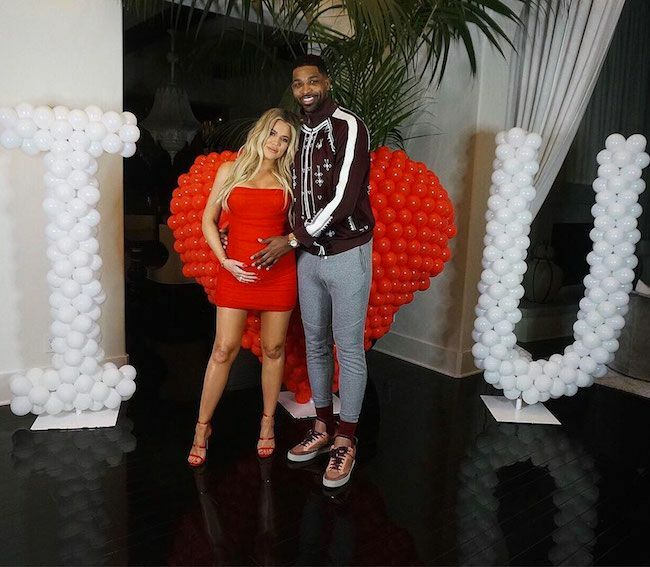 Tristan has been dragged since he and Khloe got together because receipts allege he left his then-pregnant fiance, Jordan, for Khloe. He's also accused of being a deadbeat to their child. Khloe, of course, says we just don't know the real deal. But what we do know is....what he does with you, he'll do to you.